Heart Mandalas™– The Heart Mandalas are the background visual motifs throughout Lovelle’s Garden and Planet Heart.™ They are so unique, that they have become a brand with its own identity as well. All together, the Heart Mandala style of design is such an innovative trademark method of assembling hearts that it is now a brand name and a leader in multiple industry categories. In addition to art for textiles, publishing, apparel, room decor, and software, the Heart Mandalas have inspired lines of toys that improve the balance of the brain hemispheres, as well as an entirely new way to teach physical fitness! Currently available on Amazon and other online stores, the Heart Mandalas appear in series of coloring and activity books for children. All the images in them are made 100% of hearts. The hearts have a precise geometric design that allows them to combine in stunning and mathematical patterns. Particular changes in the pattern form the basis of brain teasers for a variety of age groups ranging from 4-99. These are great for licensing for stickers, apparel, more books in the series, software, video games, and other applications. Other Heart Mandala designs are available for tiles, carpets, towels, accessories, room décor, and many other 2-d and 3d applications. The Heart Mandala wooden hearts that come with the Heart Mandala Game Books take the Mandala concept and put it in children’s hands to design! Each design in the Heart Mandala Game Books can be recreated with matching hearts that come as game pieces. 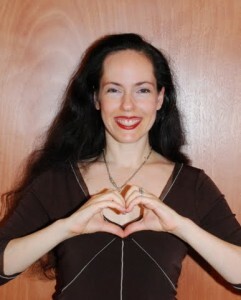 Children can build every design in the book or build their own designs using these unique trademark hearts. The hearts that are used to build these designs have special magical powers that will only be revealed in the future. But the design is quite unique. No heart on the market has this special design. 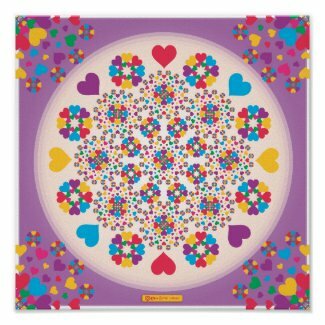 Heart Mandala designs in gorgeous colors are available for viewing for those interested in buying or licensing it. The designs can repeat and they always come with matching palettes. In addition, please inquire to learn more about how Heart Mandalas benefit the right and left hemispheres. This concept was developed by inventor Tali Lehavi. Until now, no one has recognized the logical and aesthetic benefits of the mandala and how these benefits can be used to exercise and support each hemisphere. When one creates or colors mandalas, the hemispheres duel for self-expression. In the end however, they reach a hemispheric balance and harmony. This is manifested in the pleasure that one feels after completing a mandala. As a result of this insight, Lehavi has also developed a new line of 3d fitness for the body that includes Mandala Fitness (TM) for the brain. These innovative exercises are so new that Lehavi will only reveal more about them in the future! Press here to buy the Heart Mandala Game Pieces for Book 4.
sell your art online for free with Zazzle. This image intends to help you feel like a child in an ice cream shop, filling your heart with healthy joy! Sprinkles made from hearts spiral all over the place, with a burst of energy that grows from the inside out! This image, and many others, are available for licensing. It is not legal to use this image to create your own Heart Mandalas. Just because you find it inspiring, does not mean you can use it to change a bit and give it some other style or new special effects. Doing so is illegal because of US copyright and trademark laws. Any changes that you would like to see can be communicated to me and then I can make them. I have been making mandalas that are 100% made of hearts for two decades. It is my trademark style. I have discovered these original combinations and fascinating geometrical arrangements since before the computer technology made it easy to do. It is a distinct feature of a brand that I have been building carefully so that I may license it.